Romantic restaurants, enchanting city scenery, and charming hotels will make Milan your perfect Valentine getaway. Found between Piazza Duomo and Via Manzoni, Piazza San Fedele has become a traditional lovers’ meeting place. It is not uncommon to see young lovers kissing on the stone benches near the statue of Alessandro Manzoni, author of Italian literary masterpiece “I Promessi Sposi” -“The Betrothed“, a dramatic story of two lovers set in 1628, a time of war, famine, and plague. One of Milan’s most intimate and antique areas of the city. In the evenings, artist show their works, fortune tellers predict your future and there are many wine bars and small restaurants to enjoy a romantic dinner or drink. With the castle lit up at night, an evening stroll hand-in-hand around the castle garden and courtyard is memorable. 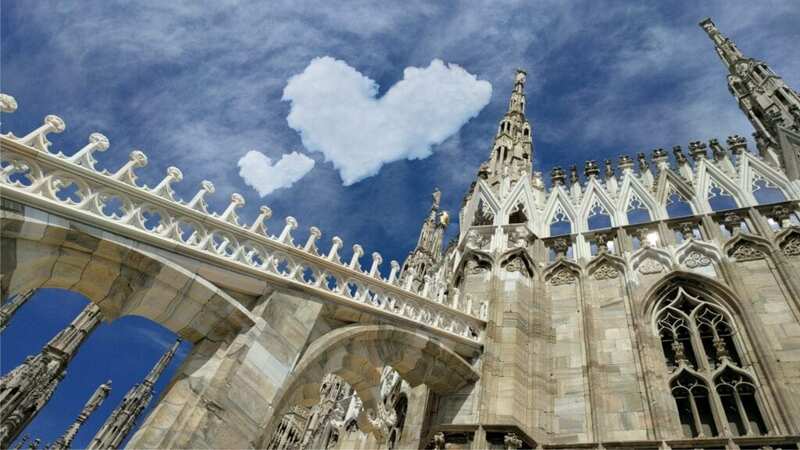 A knowledgeable, local guide will take you on a tour of the rooftops of the Milan cathedral. A few restaurants offering a romantic atmosphere and excellent food. It is advised to make a reservation in advance. Charming villages and towns like Varenna, Bellagio, Lecco, and Como are excellent weekend or day trip destinations.